Produced by Jason Donaghyand Scattered Hamlet. Mastered by Howie Weinberg. Scattered Hamlet are a quartet whose influences range from southern rock to groove metal to doom metal with the attitude of punk rock. Based out of Southern California, Scattered Hamlet have ventured outside their stomping ground and have blazed a trail throughout the Southwest and back to So-Cal, even catching the attention of the U.K.’s Classic Rock Magazine who praised the band and their EP Hillbilly Harmony. Skeleton Dixie, the band’s full-length debut album, kicks off with “Shelter”, which has the subtly of a homeowner discharging a shotgun in the house after coming home to find he’s being burglarized. It packs the kick of an enraged mule and will leave your head ringing — as does the entire album for that matter. Scattered Hamlet‘s lyrical content isn’t rocket science — its blue collar, working man’s alcohol-fueled poetry. The music is gritty, rambunctious, explosive rock ‘n’ roll at its finest. While singer Adam Joad won’t be celebrated for his vocal abilities, he plays to his strengths and showcases that swagger and attitude can go a long way. Skeleton Dixie is consistently good from top to bottom. Among the standouts are “Outlaw Anthem”, featuring a main riff that borrows heavily from Lynyrd Skynyd‘s “Saturday Night Special”, and “It’s Alright with Me”, which finds guitarist Redd Yoachum delivering one of the best melodic solos I’ve heard in 2013. “Falling Off The Wagon” has a fantastic groove that, without a doubt, will bring the house down each and every night. 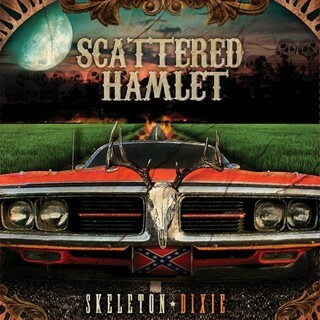 Scattered Hamlet thumb their nose at the strong arm of the law with “Guilty Plea”, which features great slide guitar and harmonica, while “Family Tree” is an ode to southern pride, whether autobiographical or not isn’t known, but brilliantly written none the less. I was keeping my fingers crossed that Scattered Hamlet would record Steve Earle‘s “Copperhead Road”, which they have worked into the live set, but instead they elected to go with “Mississippi Queen” which is more recognizable by the average rock and metal fan — perhaps a little too ‘safe’, but their rendition stays true to the Mountain classic. As a whole Skeleton Dixie hits the spot and hopefully builds on the buzz created by their EP and facilitates Scattered Hamlet to stay on the road deep into 2013.